Pam Martin has been fostering cats for Animal Care & Control Team (ACCT) of Philadelphia for 6 years. 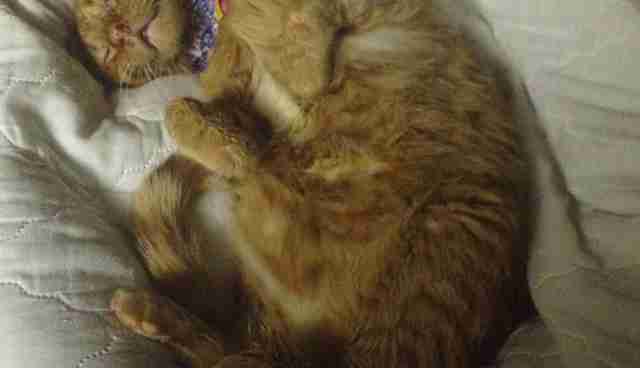 When she heard about Claus, a sick 2-year-old cat who had stopped eating or drinking, she stepped up to help - but had no idea just how sick he would become. Claus was surrendered to the ACCT after his owner moved away. 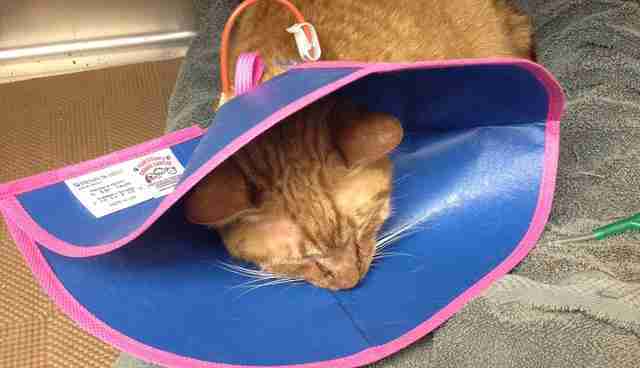 He contracted a severe upper respiratory infection during his stay at the shelter. "Cats are very sensitive to change and get stressed, and in an open admission high volume shelter they catch germs and viruses easily," Martin told The Dodo. Claus also developed calicivirus, which causes painful ulcers in the mouth. The shelter posted about Claus in a foster group, saying that he needed to be pulled by the end of that day or else he would be put down, and so Martin immediately took him in. When Martin took Claus home on August 18, he was already a sickly mess. "He had stopped eating and drinking from the pain and congestion," Martin said. Claus was severely dehydrated, had infections in his eyes and could barely swallow, walk or even stand. On August 25, as Claus slowly got worse, Martin knew he needed to be hospitalized right away - or else he wouldn't survive. 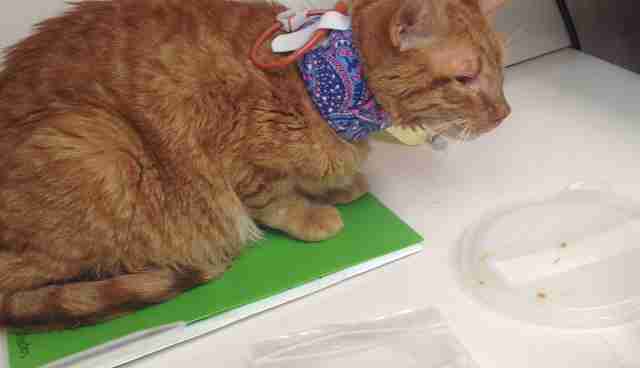 Claus was hospitalized at the Quakertown Veterinary Clinic for several days, where he received IV fluids and around the clock care. Eventually a feeding tube was also put in to help Claus get the nourishment he so desperately needed. Martin's community helped raised over $2,000 to help cover Claus's medical bills, but life was still a struggle. When Claus was at his very worst, Martin felt completely helpless. "I had days where it was painful to look at him, when he had bleeding lesions covering his face and my heart just broke," Martin said. "But it wasn't the illness that proved to be the biggest challenge, it was the psychological effects afterward which kept him from eating or drinking on his own for months." Even throughout his extreme sickness, Claus never lost his sweet personality. He purred his way through the pain, and even nuzzled and headbutted Martin. He never fought her on taking medication, and proved to everyone each and every day how truly special he was. Miraculously, Claus began to heal and his illness slowly went away - but he still wouldn't eat. Martin had to feed Claus by syringe three times a day for 3 whole months while he boycotted eating on his own, and at a point, she wondered exactly how long she could keep doing it. 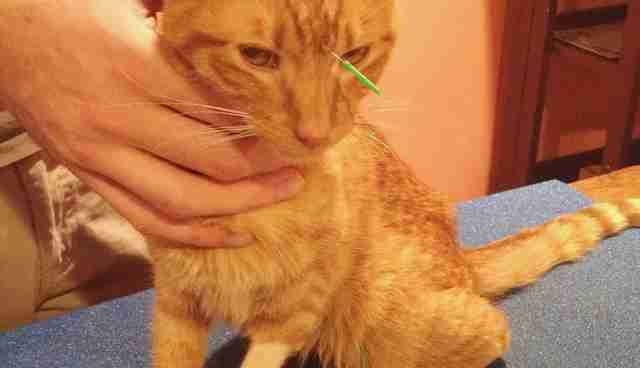 She tried everything to get Claus to eat, even acupuncture with a holistic vet. "He was just skin and bones no matter what I did, no matter what I force fed him or what meds the vets prescribed. I do admit to thinking about giving up," Martin said. 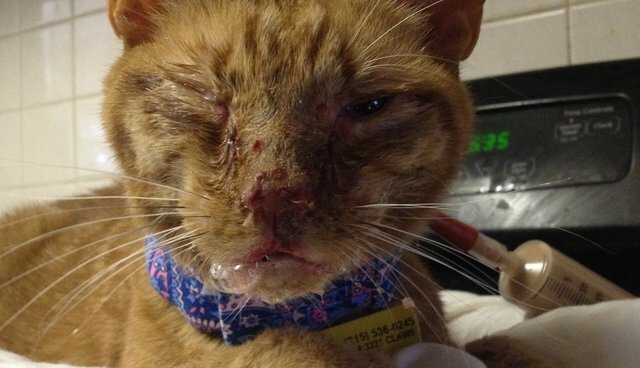 "But from day 1, this cat was a fighter, and if he wasn't giving up, I wouldn't either." Finally, on November 17, 3 months after Claus stopped eating on his own ... he finally took his very first bite towards recovery. No one can know for sure exactly why Claus finally decided to eat again. Maybe after being afraid of his past pain for so long he finally realized that everything was going to be OK.
Now that Claus is on the mend and gaining his energy back, his incredible personality has been able to shine even more. Martin describes Claus as a professional snuggler, and the young cat loves to run and play as much as he possibly can. He absolutely adores other cats, and is fine around dogs too - after surviving what he did, Claus now has nothing but love to give to the world. Martin has been fostering Claus for almost four months now, and it's finally time to look for a forever home for him. While Claus's foster mom loves him very much, she already has an older cat who isn't a suitable match for Claus. 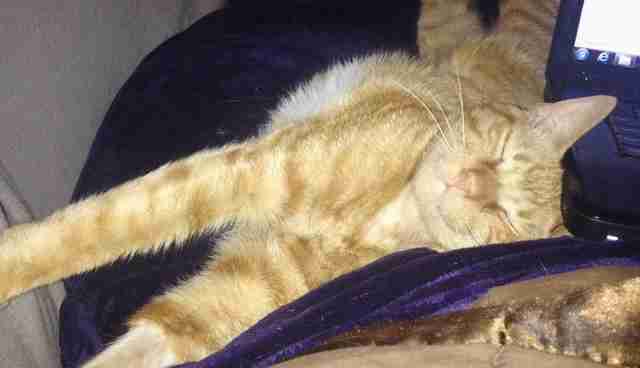 Claus would love a home with a younger, energetic cat who loves to snuggle and play as much as he does. The right match is out there - we just need to find it! 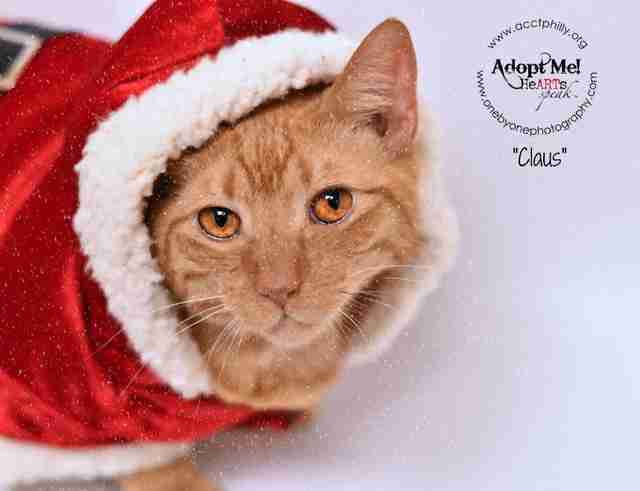 "Cats like Claus come into shelters all over the country. 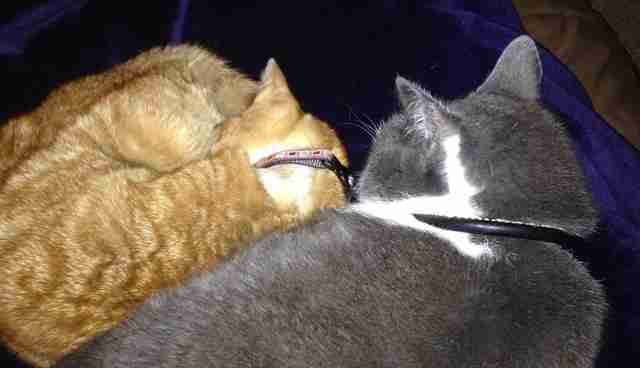 They are amazing, loving and loyal pets who have ended up homeless through no fault of their own," Martin said. 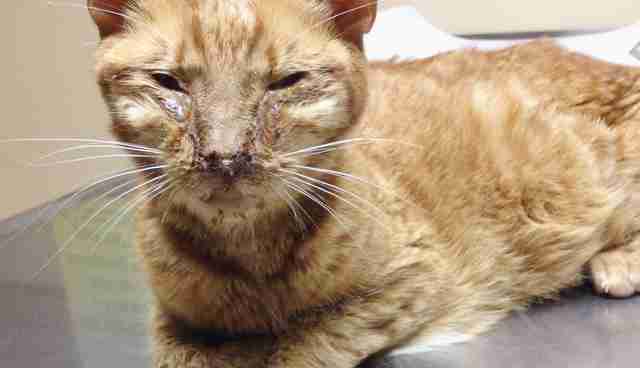 "They come down with colds and need foster homes to get well in. Most don't take the journey that Claus and I did, but they all need love and care until they can find their forever homes. 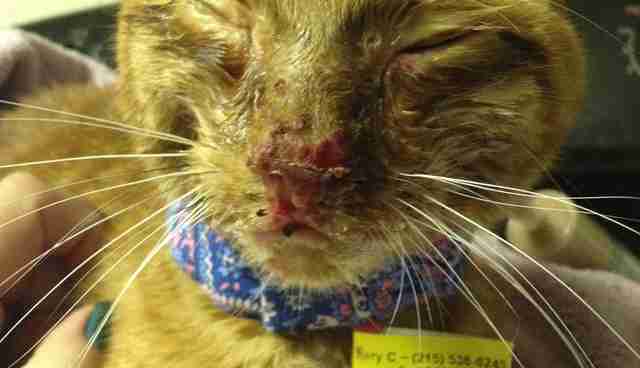 Please consider opening up your home and heart to a cat in need." 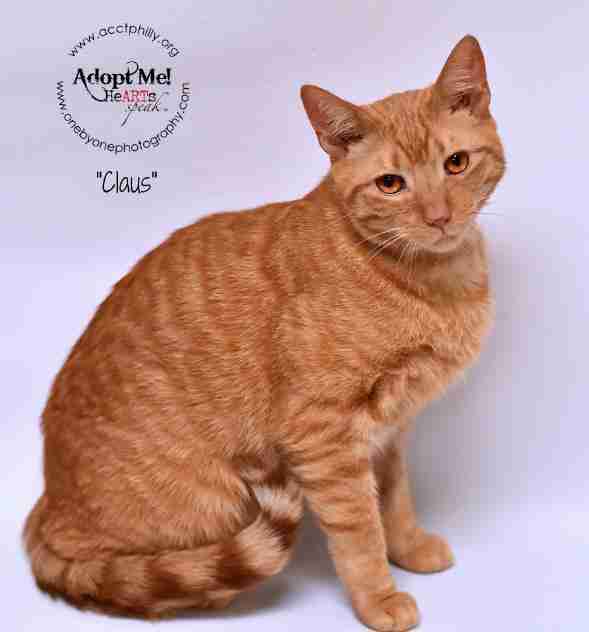 If you would be interested in adopting Claus, you can email adopt@acctphilly.org.